Surreptitiously approaching life enamored in Steele. Slicing, Searing, Scorching, Sharpeville Six. District Six. 666. Naming it free will Suffocating at the hands of man. Aiming to discover his Master plan. But chooses to remain undefined in true God nature. Like fools used as tools in a game called Destruction of Natural World Order. Reciting Penniless fortunes of fame, name & torture. Pleased at our display of infinite grandeur. Too quick to forget footsteps of error & regret. Binary vision flipped repeatedly; deceivingly. Trying to breathe air unpolluted; yet convoluted into his mainframe. News disguises; confuses & uses subversive methods to keep us from finding solutions that will truly free us. Busta rhyming about anarchist affluent in our society. Timing economy with no autonomy. Powerless currencies of inadequate commodities. Instead we’re consuming; more tenants of the gospel of abusing. Perusing strange ways of non verbal living. Instead of Natural life of Learning, Breathing; Freeing. Exonerating terms of oppression with new lessons of God given Capacity to do for self. Strengthening individuality towards societal stability. Contributing strong characters for Life. Love. & Happiness. Wat wil jy eintlik van my he? Jy confuse my met die hare twak. Ek verloor soema my plak. Die kam soe daardeur trek. Pella maak gebase op ie straighte van jou hare. Vi ‘n kerrier beg of ‘n swartsak ‘ie. Vi wie try hulle om te fob? 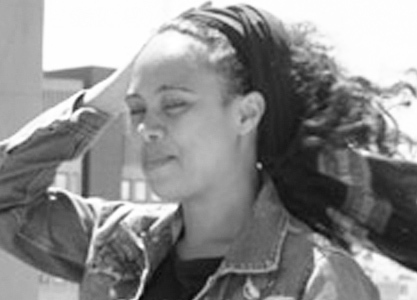 Natasha Tafari considers herself a Hip Hop poet and is driven by her observance of life. She feels that artists serve as a medium of expressing the spiritual essence of life through various creative mediums. Poets express with Words, Expression and Resonance. Natasha Tafari is also a singer, songwriter, scriptwriter, emcee and events manager. Natasha has organized her own events including Wordsworthsaying (2010), Hip hop custodians and Community jam. She has facilitated workshops at the Grahamstown festival, Artscape theatre in Cape Town and the Language commission. She has performed across venues in Cape Town including the Sparkling Women’s Gathering, WordsWorthSaying Raga’zzi, Verses and the former Badilisha’s Fireword Fridays.